The Catholic Church is a false religion. Catholics have been fabricating new doctrines for centuries. 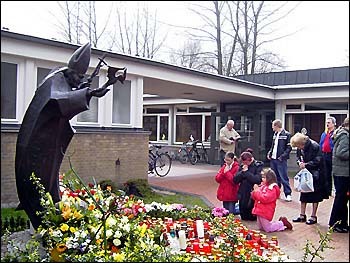 Notice the children and adults worshipping the Pope in the photo. It is idolatry! Please understand that I don't condemn anyone, for the Bible condemns all of us as guilty, dirty, rotten, hell-deserving sinners. My salvation solely rests in Christ's righteousness, because of the precious blood that He gave for our sins. My intention is not to be unkind; but rather, to expose false religions which lead people away from the truth of God's Word. Those poor children. The Bible teaches that salvation is by faith alone in Jesus Christ. “For by grace are ye saved through faith; and that not of yourselves: it is the gift of God: Not of works, lest any man should boast.” There you have it... NOT OF WORKS! Abraham offered Isaac upon the alter in Genesis chapter 22. 6And he believed in the LORD; and he counted it to him for righteousness. Thus, James was speaking about the FRUIT of Abraham's faith; but Genesis 15:6 speaks concerning the ROOT of Abraham's faith. Abraham was justified in the eyes of God by faith alone. Abraham was justified in the eyes of men by works. The Catholic Church horribly corrupts the teachings of the Apostle James to teach the damnable heresy of Works Salvation (which is a guaranteed road to Hell). Lengthy books have been written refuting the Jehovah's Witnesses, a false religion comprising about 6,000,000 members worldwide; but the hellish Catholic religion has over 1,000,000,000 members, and much fewer books have been written to expose their demonic teachings! Walter Martin in his well known book, KINGDOM OF THE CULTS, doesn't even mention the hellish Catholic religion. How could any professed Christian write a book exposing Satanic cults and fail to expose the BIGGEST false religion in the world... The Catholic Church? Dr. Martin's successor, Hank Hanegraaff, aka, “The Bible Answer Man,” has also utterly failed to expose the cesspool of iniquity of Roman Catholicism. Truly, “FOR LOVE OF MONEY IS THE ROOT OF ALL EVIL...” (1st Timothy 6:10). The once great Jack Van Impe—who at one time preached at the Independent Fundamental Baptist landmark, Hyles-Anderson College, who warmed the hearts of millions of Christians with his knowledge of prophecy and preached concerning the coming Rapture—has totally sold-out to Satan, crawling into bed with the whore of Roman Catholicism, praising the sinister Pope as God's man, and refraining from exposing the BIGGEST and most DEMONIC cult in the world... Roman Catholicism!!! If feminists want to go to Heaven it will have to be through “a man,” and that man is Jesus Christ. 1Verily, verily, I say unto you, He that entereth not by the door into the sheepfold, but climbeth up some other way, the same is a thief and a robber. Make your choice: the Lamb of God, or the Devil's Pope? 13For such are false apostles, deceitful workers, transforming themselves into the apostles of Christ. Satan has stolen Christ's identity and he aims to take you to Hell with him, just as AC/DC sings in their demonic hit song, HELL'S BELLS. Have you believed a lie? Everything about Catholicism is a cruel hoax, intended to keep men blinded from the truth, and lead them into Hell forever. Religion wants to fit us with glasses; but the Lord wants to open our eyes. 1Help, LORD; for the godly man ceaseth; for the faithful fail from among the children of men. Catholics have religion without righteousness, teachings without truth, churchianity without Christianity, and crucifixes without Christ. Roman Catholicism is the biggest false CULT in the world! There is NOTHING in the Bible about purgatory. There is NOTHING in the Bible about praying to dead saints. The Catholic Church is Satanic. There is NOTHING in the Bible about praying to statues. There is NOTHING in the Bible about not eating certain meat on Fridays. There is NOTHING in the Bible about worshipping the dead. There is NOTHING in the Bible about digesting Jesus' flesh and blood. The Catholic religion can't make up it's mind and keeps changing it's dogma (doctrine). They also ADD good works to faith alone in Christ Jesus. Catholicism is a false religion, based upon faith in good works and the Roman Cult, not the Lord Jesus Christ. Roman Catholicism bases many of their beliefs upon TRADITIONS, which they esteem as also being inspired by God. This is a lie of the Devil, unsupported by the Scriptures. Read more on TRADITION. The Apocrypha is not part of the Word of God and was rejected by the King James translators, yet they included it in between the Old and New Testament because of its historical value. Is the Catholic church's doctrine infallible? No! The Rosary is Blasphemy Against God!